Thank you to MASE, the Multicultural Alliance for a Safe Environment for contributions to this post. July 16 is a date that echoes repeatedly in the nuclear history of the U.S. — and especially loudly in the state of New Mexico, where three disastrous events have occurred on this date. In 1945, the first atomic weapon was detonated at Alamogordo, New Mexico. Also, 73 years later today — in 2018 — the US NRC opened up the hearing process on potentially the largest nuclear waste dump in the world, in the southeast corner of New Mexico. And virtually in the middle of that timeline — 39 years ago, on July 16, 1979 — there was the Church Rock uranium mill tailings spill, the worst spill of radioactivity, the largest single release to our environment, by the nuclear industry. It has been as invisible as the radiation from it that continues to this day… If instead you look to the people, to the communities living along the Puerco River near Church Rock, in northwestern New Mexico you will see the devastation of cancer, and the footprints of other non-cancer radiation impacts from the 1979 event. These have been all too visible. Have you heard of the Church Rock uranium disaster before? Most likely you have not. It began the same year, 1979, as the three-quarters reactor core meltdown at Three Mile Island (TMI) near Harrisburg PA. TMI as an icon is burned into the memories of a generation, but real information was buried. In the view of many, the aftermath was subject to a federal “Cover Up.” Church Rock needed no national Cover Up because the nation missed it. Rural, Native, Latino, low-income Anglos did not make the news…and impacted people suffered the same lack of disclosure and honest concern as most other nuclear victims. Here is a little of what happened July 16, 1979: In the early morning, an earth dam broke on a private site owned by United Nuclear. The dam was part of an impoundment holding liquid and sludge wastes from milling natural uranium ore to produce Yellow Cake (uranium oxide). A torrent carried 1100 tons of radioactive sludge in 94 million gallons of radioactive waste water including highly radioactive decay products of uranium (thorium, radium, etc). This radioactive flood found its way to the nearest dessert stream bed—or arroyo—and flowed off the private United Nuclear site onto the Navajo Reservation and into the lives many people who have been directly, and indirectly, hurt to this day. The uranium effluvium remains part of the headwaters of the Puerco River…and the downward seepage from the dry arroyo has poisoned ground water tapped, to this day, by many wells. Caption: The break in the earthen dam that drained 1100 tons of radioactive sludge and 94 million gallons of radioactive waste water into Dine lands and the Puerco River. Photo courtesy of US EPA. It is heart rending that emergency warnings and information did not flow immediately to the local community: it took days after the dam failure for written flyers to be distributed to local residents, farmers, and ranchers, many of whom did not hear the first reports because they did not own a radio. Tragically when the flyer did reach people, it was in English given to people who speak Native languages and Spanish. The flyers also did not explain the radiation danger in lay terms. 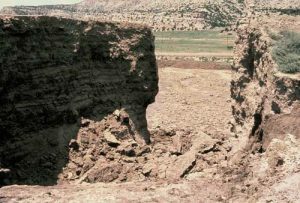 Much of this recounting is based on a Navajo Times report, “Poison in the Earth: 1979 Church Rock spill a symbol for uranium dangers,” by Marley Shebala, published on the 30 year anniversary of the Church Rock uranium spill disaster (2009). Next year (2019) will be forty years since the dam broke and the Church Rock uranium disaster began. One very positive outcome of this devastation has been the formation of the Multicultural Alliance for a Safe Environment. MASE is dedicated to working on the many impacts of uranium on local communities. MASE has marked the anniversary of the beginning of the Church Rock uranium disaster each year. 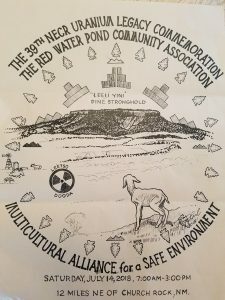 “RWPRCA” stands for Red Water Pond Road Community Association—people directly impacted, to this day, by the events of 1979. MASE offers this link where you can learn more about the Red Water Pond Road community. MASE is working to reduce the broad range of harm from the uranium industry in the region. In 1968, United Nuclear opened the largest underground uranium mine in the USA near Church Rock, which has had many ongoing consequences in addition to the spill. The MASE Uranium Impacts factsheet features maps of uranium mining impacts in the Red Pond area. The maps were created by Southwest Research and Information Center. Like all the other major nuclear accidents, Church Rock stands as an emblem, pointing to the dangers of using uranium and nuclear technology. Nuclear is dirty every day; the ongoing-day-in-and-day out health consequences that begin with uranium mining are happening now, today, in nations across the world.